My Bullet Journal with Sketches. Who is this goddess of the underworld, and why would anyone want to fight her? This goddess is from the underworld, so it goes without saying that she might be evil. Lethe is the personification of oblivion, forgetfulness, and memory loss. For ancient Greeks Lethe (memory loss) was feared alongside Ignavia (sloth), and Limos (starvation), and this terrible trio lurks in today’s modern world too. (Except for Limos; starvation not so much, if you catch my drift). Today’s modern lifestyle requires us to remember everything and manage tasks simultaneously. My bullet journal with more sketches and notes. I've used different tools over the years to combat Lethe. I've used organizers, planners, notebooks, and endless digital applications, and they have all failed at some point to organize my lifestyle and allow me access to my information. Some analog notebook systems are just too expensive, and undoubtedly price gouge users. Some digital systems don’t allow for quick input, or don’t work as intended, or I've allowed my phone battery to run out. Simplicity, reliability, and cheap are three qualities that I look for when organizing my thoughts, to-do-lists, and freehand sketches. I remember using a Franklin planner long before they became Franklin Covey. ( To give my readers a time frame: I think Franklin Planner became Franklin Quest in 1997, then later Franklin covey.) Not only were the journals and refills expensive, but you couldn't even purchase the system without taking the day-long seminar. Talk about pricey and inconvenient. I've used digital systems, but they all fail me in one important way. The information I put into the system ends up in the cloud, and I never see it again because I forget about it. I never review the information, and because it is so fast and easy to input information, my mind is not imprinted with what is there. And don’t get me started on digital sketching; the tech is not quite there yet. So what is my weapon for fighting the mythical Lethe? A bullet journal. Bullet journaling is an analog way to make attractive notes and sketches. 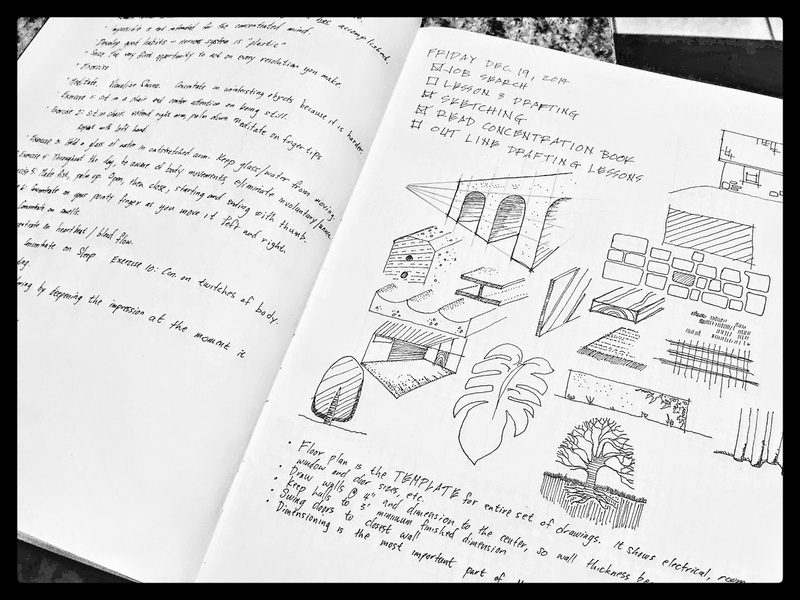 It’s a quick way to plan busy lifestyles with indexes, and to-do lists, and when lightly modified, freehand architectural sketches. It’s simple and flexible, and I've adapted it to fit the needs of an architect battling imaginary Greek villains. At the end of each month, the previous month is reviewed and brought forward. Three categories, a few icons, a calendar page, and an index page are all that are needed to start. The official website can be seen here, or watch the YouTube video below. 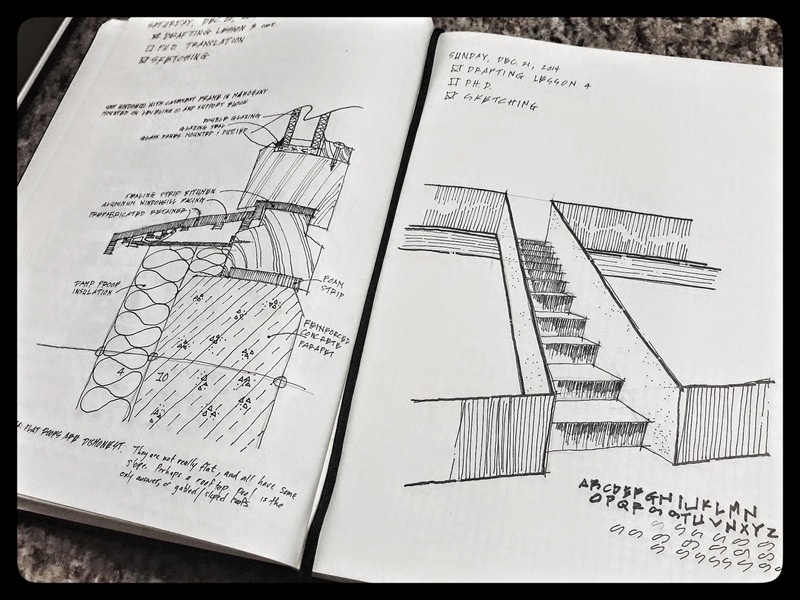 My tips for making the bullet journal work for an architect are pretty simple. 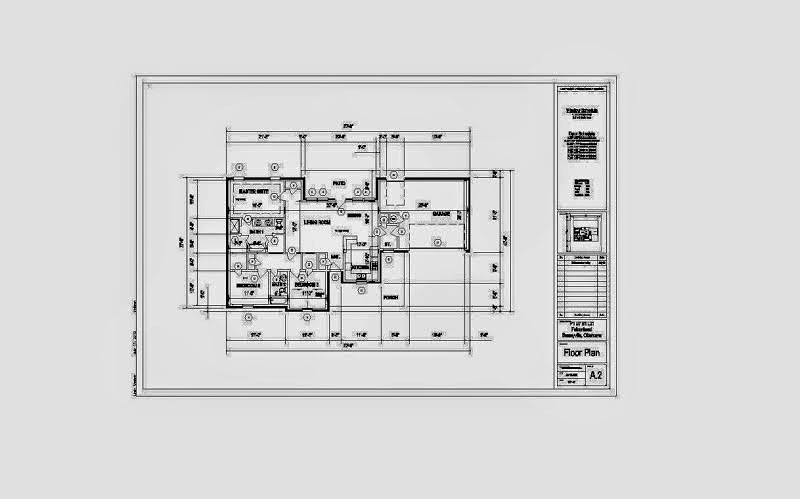 Architects need to sketch, and they need to record information for later review. The first tip is to use a large notebook. I chose an A4 size Leuchtturm1917 notebook because it allows for copious note-taking and sketching all on one page. The second tip is to choose a notebook with blank pages, or at least dotted pages. The third tip is to never have more than one day per page. All that extra prime real estate is begging for you to construct the next falling water on it. Seriously the paper in this notebook is so nice, I can’t wait to use it. Fourth tip is to use a sharpie fine point marker. The ball point pens gouge the pages, and show on the reverse side of the page. Regular sharpies bleed through, but the fine sharpies are bold and dark, and don’t ruin the paper. Why does the bullet journal work so well against Lethe? The bullet journal works so well because it imprints information upon the mind, instead of mindlessly pushing information out of sight. It helps my natural process of recollection. The forward information transfer at the end of each month alongside the task of handwriting somehow imprints upon the mind so very well. After writing it manually, I can remember my task list without looking. Go figure. With digital systems it seems to be sync it then forget it. This is not to say that I will abandon digital organization. I really like Google keep, and timed reminders, so moving forward I will certainly utilize a hybrid solution with the bullet journal at the center. Do you use the bullet journal? What productivity tricks are important to you? Share your thoughts and your bullet journal ideas in the comments below.